It's a bitter cold Ash Wednesday in Dorsetville, New England, where the last wool mill shut down five years ago and only Yankee grit gets its citizens out of bed for another day of facing challenges with wry humor. Poor in worldly goods but rich in faith and compassion, they have been bound together for generations by the gaudy monolith of St. Cecilia's church, long a white elephant to the Catholic archdiocese and now slated to close-after the last mass on Easter Sunday. Father James Flaherty despairs of turning the parish finances around, or even of fixing the cantankerous furnace. What will become of his flock? And of their beloved eighty-two-year-old Father Keene, increasingly eccentric but beatific, who had planned to live out his days at St. Cecilia's? Diners at the Country Kettle-where plates have never matched but you get the best cup of coffee in the valley-worry, too. Among them is waitress Lori Peterson, who needs her own miracle-a bone-marrow match for her husband, Bob. And Matthew Metcalf, a rash young genius in trouble at Dorsetville High for hacking into its computer and inadvertently exposing some embarrassing secrets. 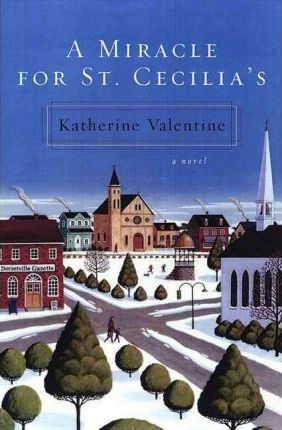 Delightful and moving, with a cast of endearing and quirky characters, A Miracle for St. Cecilia's will warm hearts and enchant readers everywhere. Katherine Valentine is an American folk artist who has been a regular guest on Lifetime's Our Home show and an instructor with the New York City Museum of American Folk Art and the Brookfield (Connecticut) Craft Center. Her 1980 near-death experience, the subject of several books, has been featured on television shows, including Good Morning America.